Are you kind of infamous for your gigantic appetite (pizza at 3am, anyone?) and a... somewhat messy trail you leave in your wake? C’mon, be honest. Does your S.O. sometimes get on your case about it? Relax! We aren’t here to chastise you. On the contrary. We want you to go all-out gross-out this Halloween. And...we hear you’re a bit of a movie buff. So let’s see if you can guess which costume we have in mind for you. Ok, this classic film character shares your traits love of snacks and second breakfasts, and maybe he even contributes to a mess more than he cleans it. He’s mostly peaceful, lives in a hotel...nothing? OK, how about this: he’s made entirely of ectoplasm! Yep. You got it. It’s Slimer--everyone’s favorite green ghost! In this Inflatable Slimer Costume you can haunt any Halloween shindig you choose; everyone will be busting to meet you! And, it doesn’t hurt that you can be your ravenous self all night, eh? The wonder of this officially licensed supernatural costume is in its design--it’s completely battery operated and is ready to puff you up all evening long. Your pals will be practically oozing laughs! 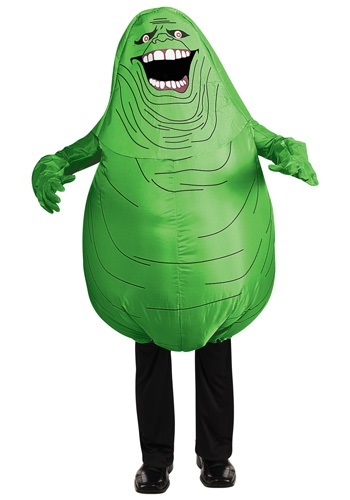 So whether you plan to attend a schmancy dance in the Sedgewick Hotel’s Alhambra Ballroom or grab a quick hot dog from a cart on the corner, we’re guessing this Slimer-printed blow-up bodysuit will surprise, delight, and yes, maybe even terrify all you encounter as you haunt around Halloween night.